This simple exercise comes with many variations and progressions. The blue center backs in possession open wide and switch the ball very quickly between each other. The players must play efficient and quickly – playing hard firm passes to the back foot of their partner, receiving the ball with hips opening up, not taking extra touches and being accurate with all passes. The first drill has one CB drive the ball through though a gate to the opposite player on the other side in red. 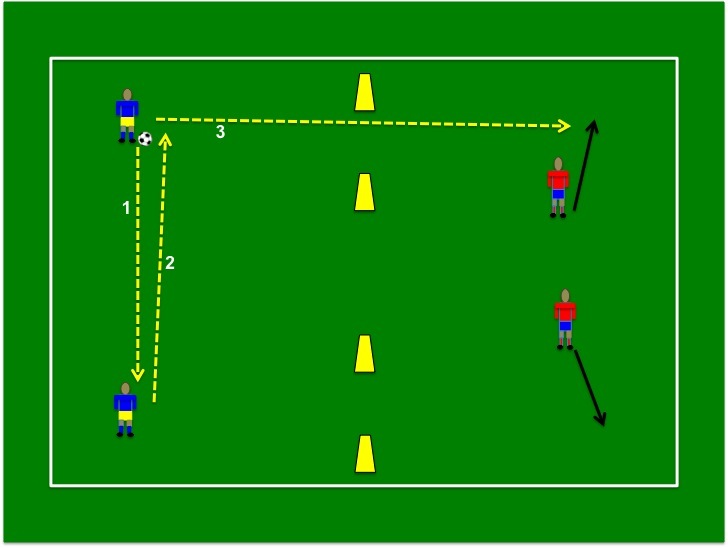 After passing the ball both the center backs should step up and move closer together. This simulates what actually happens in a game. The CB’s in possession always open up wider. When Vidic was at United he has a 93% passing percentage for the entire season. That statistic alone shows how important passing ability is a center back. I will go over the progressions of this training in my next post.